There is nothing lame about meeting bandmates online. Just ask the members of New York-based quintet Freelance Whales. 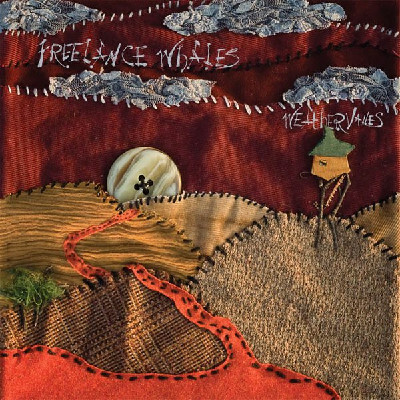 When they connected in early 2008, no one could have predicted the group would bring to life a tidy patchwork of finger-plucked indie-folk tunes stitched with twangy banjos and sewn with whimsical glockenspiel notes. Frontman Judah Dadone is the haunted romantic, but the quiet mood of Weathervanes is not so much about a broken heart as it is about a deeper sense of loss. The wordsmith was inspired by his childhood home (which he believes he shared with a female ghost) and regressive dreams of that time in his life. Sometimes his lyrics are tongue-in-cheek, like on the track “Location” (“No one sees you in your pixilated fishnets / And your black and orange barrettes”, he sings, addressing a ghost), but they are always cloaked with innocuous charm. Dadone trades lead vocal duty with Doris Cellar to bring to life the boy/girl relationship. Together their vocals call from the physical realm and yearn for a response from the ethereal. Kevin Read, Jacob Hyman, and Chuck Criss round out the group and inject a subtle rock influence to the trembling “Broken Horse” and frolicking “We Could be Friends”, adroitly resisting the threat of an overly saccharine debut. Playing with ghosts has never been so worthwhile.